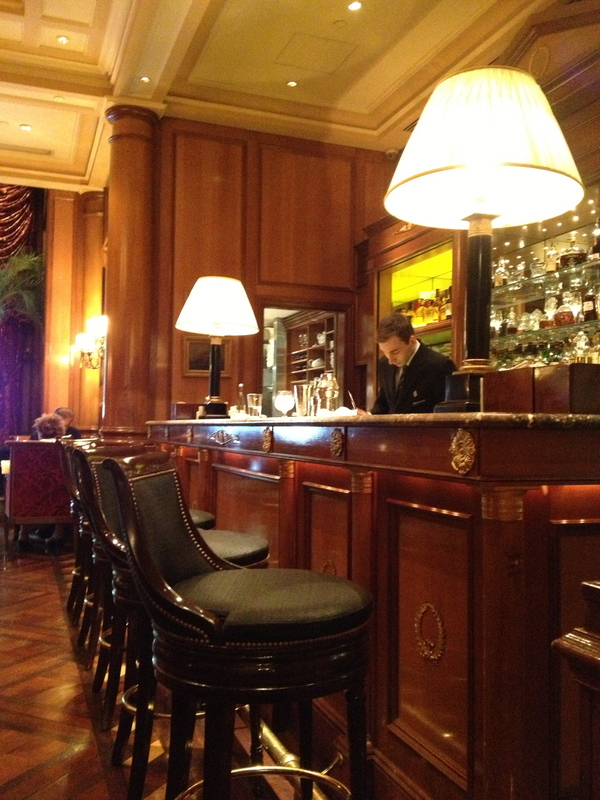 The bar at the George V in Paris is perfect. La Hedonista and I arrived in the late afternoon for early cocktails before an early dinner that would allow us to catch the last Eurostar back to London. Just enough time for one drink and a bucket load of olives and delicious nuts. It’s stupidly expensive. Our cocktails were €26 each…but then you are paying for the decor that makes some London 5 stars look as if they are furnished from Ikea, the faultless and generous drinks, those olives and nuts, a fantastic floral display and the sound of Elena, a glamorous blonde Russian pianist, playing some mean boogie woogie and swing. I had a cucumber Martini. It was a large measure of chilled Hendrick’s gin with some frozen cucumber balls inside. Simple and uncompromising. La Hedonista went for a Confide in Me, a shot of Bombay Sapphire Gin infused with coriander, Saint Germain liquor, Martini dry, lime juice and ginger. It was the sort of drink that subtly insinuates its way into your system, seducing you into thinking that you are still sober and that this fragrant concoction is virtually alcohol free. Forget it-it isn’t. If you can’t afford a drink at the George V borrow or steal the money so you can do it at least once in your life. I ended up duetting with Elena. No one batted an eyelid.